This article was derived from an article by Dr. Frank Woeste, P.E., Professor Emeritus at Virginia Tech and a wood construction consultant, and Peter Nielsen, cofounder of MGNT Products Group, LLC, a consulting and product design company for the tile and construction industries. 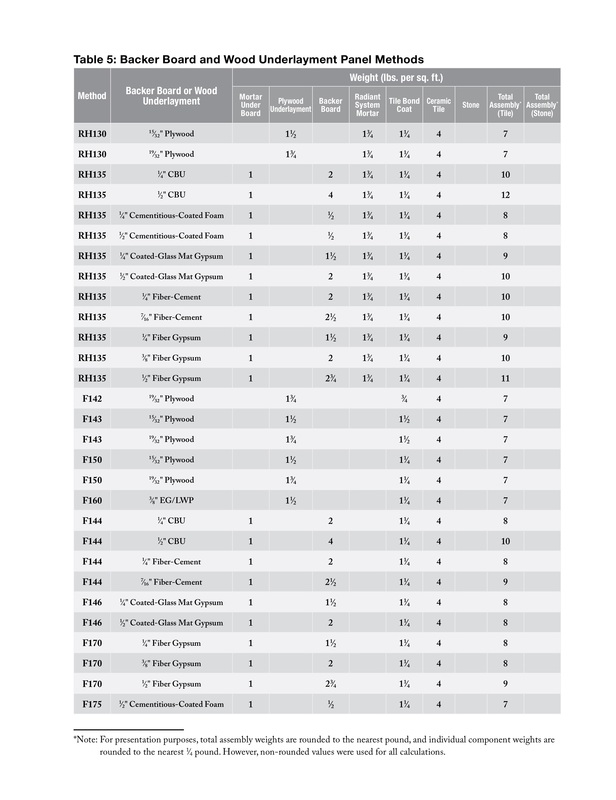 This version of the information was generated by NTCA to provide a brief overview of their wood framing recommendations for hard surface flooring. Two kinds of designers are involved in construction: design professionals responsible for performance and structural integrity and interior-focused designers responsible for the final appearance. Although they have very different roles, some of their decisions should be coordinated. For example, they should join forces when hard surface flooring – like tile and stone – is selected since these materials are on the heavier end of the spectrum, requiring more robust structures to support their weight. Hard surface floors are also more susceptible to problems than flexible floor types are when the weight of a concentrated load, like a dreamy kitchen island, is not adequately designed for. This article provides guidelines to design professionals for specifying adequately supportive structures for tile and stone floors in new construction wood frame buildings. 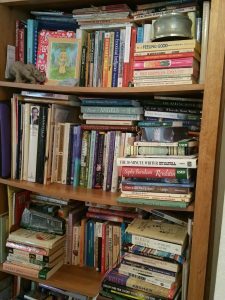 Sagging book shelves illustrate the concept of creep deflection; over time, shelves that are not strong enough for the weight they are loaded up with will bow. A key factor is “dead load,” which is the cumulative weight of everything that a structure needs to support continually, including the flooring. When the actual dead load in a wood frame structure exceeds what was designed for, it over stresses the wood framing and over time can result in excessive “creep deflection,” a permanent bowing of the structure. An easy way to envision creep deflection is to picture an overloaded bookcase. The shelves will bow over time – and permanently – under the weight of the books. Similarly, a home or building can be overloaded, for example by being structurally designed for luxury vinyl planks (LVP) flooring rather than the interior designer’s vision for ceramic planks. Some creep deflection is inherent and expected in wood frame construction, and not an issue for tile and stone floors. Overloading is what causes excessive creep deflection, possibly beyond what a tile or stone floor can withstand. Potential for and severity of a tile flooring issue because of excessive creep is tied to the amount of overloading and passage of time. Weighty design features, like large kitchen islands with solid surface tops, and heavier-than-usual appliances, such as a Sub-Zero refrigerator, are examples of concentrated dead loads that additionally need to be designed for, structurally. This is true regardless of flooring type, but something to be especially aware of when the floor will be ceramic or stone tile. That’s because rigid, hard surface flooring materials are where concentrated overloading of a wood frame structure might become visually apparent, in the form of cracks, due to their inability to bend. To facilitate adequate structural design for tile and stone floors, the TCNA Handbook for Ceramic, Glass and Stone Tile Installation provides the approximate per square foot weight of tile, stone, and installation materials, individually by material type (i.e., 1/2” thick cement board weighs 4 lbs. per square foot) as well as cumulatively by installation method (i.e., Method F144 weighs 8 or 10 lbs. per square foot, depending on whether 1/4” or 1/2” cement board is used). Using this information, located in Appendix B, building designers can arrive at accurate dead loads. Appendix B of the TCNA Handbook is a compilation of material and system weights. Method F141 Stone weighs 23 pounds/square foot with a 1-1/4” mortar bed. Accurate dead load is important because dead load influences the maximum span (length) of wood joist that can be used, per International Residential Code (IRC) guidelines. These guidelines provide maximum allowable joist span separately for an assumed dead load of 10 psf and 20 psf. Remember though, dead load is not just the flooring. 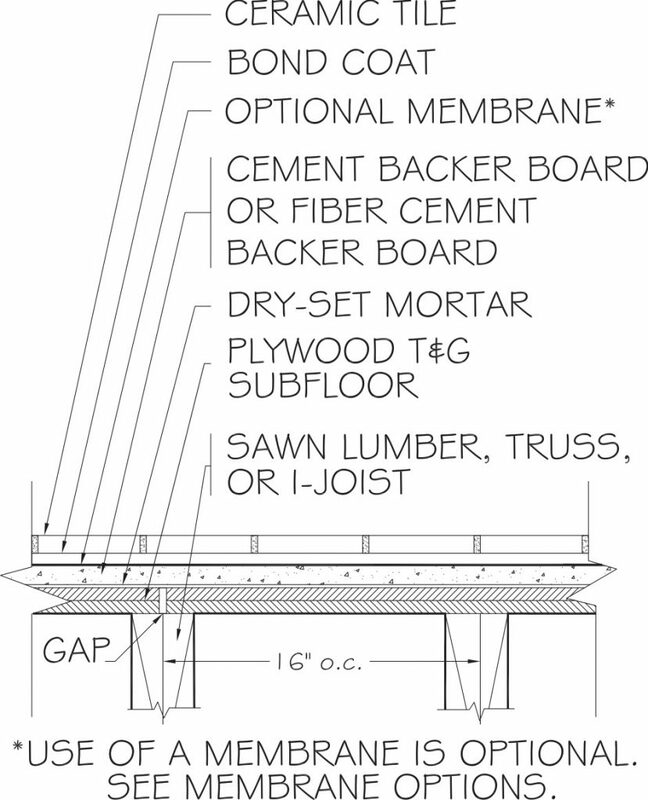 So, while the separate span tables may be generally used according to flooring type (e.g., follow guidelines for 10 psf dead load when lighter floorings like carpet will be installed, and guidelines for 20 psf dead load for tile and stone), one should not assume they apply in all situations. Additional dead load could be present from other elements, causing total dead load to exceed 10 psf where a lighter floor finish will be installed or exceeding 20 psf where ceramic or stone tile will be installed. Not to mention, some tile and stone installation methods on their own exceed 20 psf, which demonstrates that IRC span tables aren’t always enough. Research indicates that an even more important consideration for tile and stone floors in wood frame construction is the thickness/stiffness of the subfloor, although not necessarily because of system-creep-inducing overload. Rather, the subfloor sheathing could simply deflect (bend) between joists under an applied load more than a hard surface tile can withstand, even if the sheathing is otherwise adequate within the full design scheme to support the expected loads. 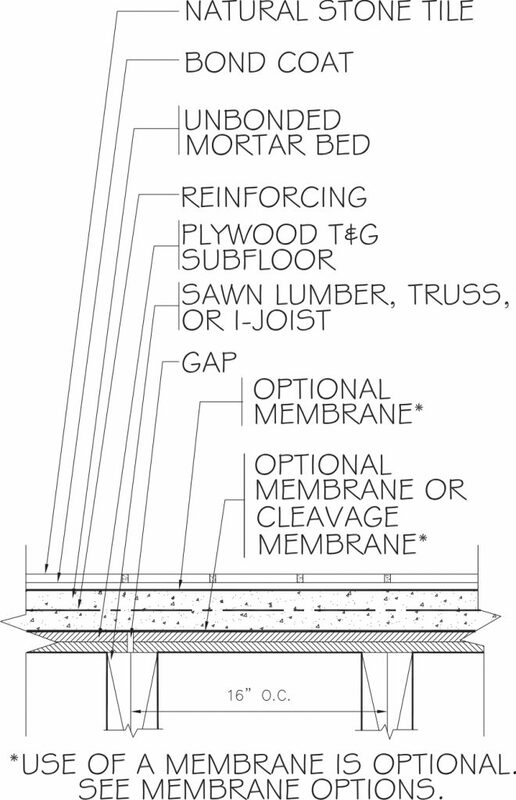 In Method F144, the wood subfloor can be 19/32” thick or 23/32” thick and relates to whether the installation methods falls under the residential or light commercial service rating. This industry-specific consideration, not addressed in IRC, is addressed in the TCNA Handbook through more stringent deflection limits. Specifically, the TCNA Handbook limits deflection under concentrated loads, whereas IRC deflection limits are for uniform loads. What this means for building designers is that the minimum subfloor thickness/stiffness required by code for strength may not be enough. A thicker/stiffer subfloor may be needed to limit subfloor bending between joists. More robust framing may also be needed, again to go beyond the strength consideration to further limit bending related to concentrated loads. The heavier and more concentrated the load, the greater the need to beef up the floor framing to limit bending. As an example, consider the large kitchen island scenario. With 30mm (3cm) thick stone tops and normal contents being stored inside, this popular kitchen feature could present a 40 psf dead load, calculated by using the square footage of the island’s footprint as the area. In service, the framing and subflooring directly below and around the island is subjected to a substantial sustained load that produces creep deflection, but only in that area. 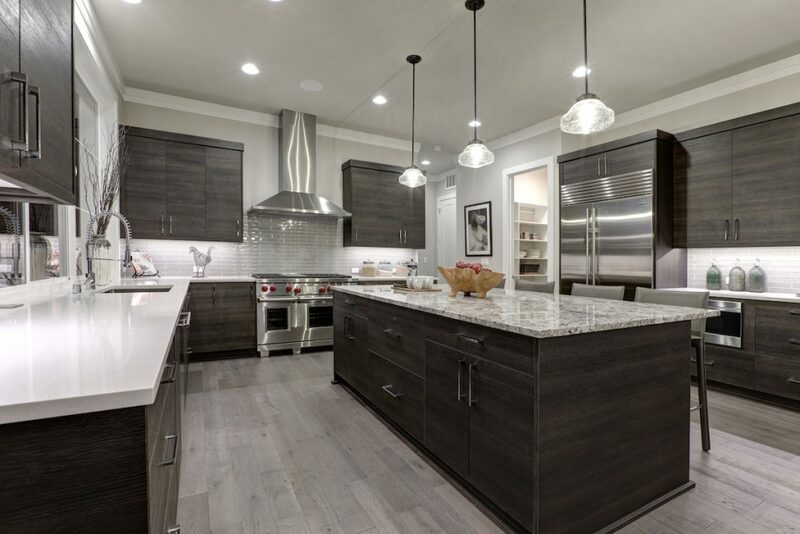 As such, for hard surface floors, building design should incorporate more stringent framing requirements in areas where concentrated dead loads are expected, with kitchen islands a particular focus because of their widespread use. Because this kitchen island is oriented parallel with the wood joists, its weight is on fewer framing members. It’s not practical, though, to expect a customized calculation and specification for every kitchen island. A more practical approach would be to follow general guidelines that are widely effective and easily incorporated into documents and processes. For solid-sawn and I-joists: joist spacing beneath kitchen islands shall be reduced by one-half and indicated on the joist framing plan. For floor trusses: floor trusses beneath kitchen islands shall be doubled. The generalized “overbuilding” that some of these recommendations suggest may not seem an easy ask in an industry that prizes value engineering. But they do have enormous value – not in material cost savings – but from having effective boilerplate solutions to a common design challenge that are also practical with respect to implementation. Tile and stone professionals would be well served if these guidelines were better known and understood by building designers. TileLetter readers are encouraged to help make that happen by circulating and posting the information freely.